Who doesn't want a little Hazarai? And what exactly is "Hazarai"? Apparently (and we have to look these things up), it's a Yiddish word that means "a lot of extra stuff." 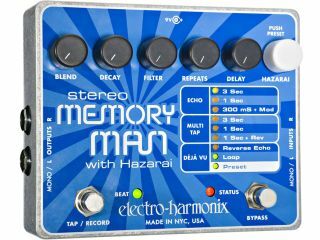 Which certainly would describe the new Electro-Harmonix Stereo Memory Man. It's a multi-tap delay, an echo, a reverse echo, a performance looper with tap tempo, it's programmable, and it's got Hazarai. Even without "a lot of extra stuff," it seems like a most impressive unit. All in all, it sounds like one sweet pedal. US list price is $286.00. For more information, visit the Electro-Harmonix website. And here's a little YouTube video demonstration.